All wire in this category contains 18ga Stainless Steel wire in various shapes. It is available in Dead Soft and Half Hard in round, half round and square shapes. 18 Gauge (1.02mm) There are 5 products. Made by Beadalon in the USA, this wire is 18 Gauge 3/4 Hard, Half Round 316L Stainless Steel Wire, sold as a 5 metre length. This wire is flat on the bottom and curved on the top. If you order more than one, you will receive multiple pieces of 5 metres. 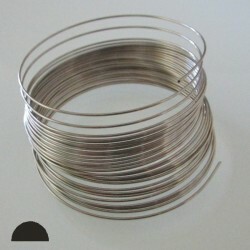 Made by Beadalon in the USA, this wire is 18 Gauge 3/4 Hard, Round 316L Stainless Steel Wire, sold as a 3.5 metre length. If you order more than one, you will receive multiple pieces of 3.5 metres. Made by Beadalon in the USA, this wire is 18 Gauge 3/4 Hard, Square 316L Stainless Steel Wire, sold as a 1.75 metre length. If you order more than one, you will receive multiple pieces of 1.75 metres. This wire is 18 Gauge Dead Soft, Half Round 316L Stainless Steel Wire, sold as a 5 metre length. This wire is flat on the bottom and curved on the top. If you order more than one, you will receive multiple pieces of 5 metres. 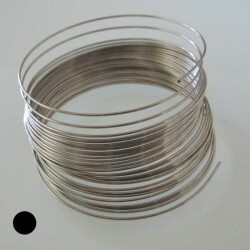 This wire is 18 Gauge Dead Soft, Round 316L Stainless Steel Wire, sold as a 3.5 metre length. If you order more than one, you will receive multiple pieces of 3.5 metres.